Today I want to introduce everyone to Jewelry Elegance by Jill. 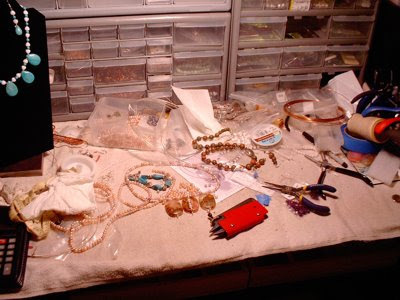 From her studio in Marietta, Georgia Jill combines a wide range of jewelry skills and techniques in her unique handmade collections. Today copper is finally enjoying its day in the sun as a popular metal; the warm, earthy hue brings out nature’s bounty when blended in this stunning copper and gemstone bracelet. Jill’s carefully executed wire coils enhance the natural beauty of the gemstones, and add dimension and depth to this bracelet. Serpentine-like curves hold the eye as you look all around the design, finding new details at every curl. As I explored Jill’s work, I was next struck by her unique take on the traditional chain maille technique! What a beauty she created in gold filled wire with pretty heart swirls wrapping delicately around the wrist in this glamorous bracelet. Look at the extra element of the gold bead on each ring connection. What a fresh look that’s suitable for day or evening wear. And anyone who sees this piece will recognize the quality and Jill’s obvious attention to detail. But Jill’s skills and breadth of design doesn’t stop there. She completed a multi-strand in small seed beads in turquoise and brown. Another in color this year, Jill is one designer who tracks the trends and provides fashionable creations for everyone. Yet, this piece isn’t a fad, by any stretch of the imagination. This gorgeous necklace can be a staple component of your wardrobe. I can see this under an open blouse, with a suit jacket for fall and winter wear; yet it would look equally lovely with summer jeans and tops! The turquoise color really pops between the brown, and the many strands Jill created ad d texture and dimension. Jill also has a very light, flirty look to some of her work. I wanted to share her Drop Earrings, made with shell beads as an example of what I mean. The small Swarovski cubes really enhance the color of the shells. What fun---imagine these dangling from your ears, swinging lightly as you move! Jill has many other bead designs in her store and even more are shown on her website. She has a gorgeous gray ocean jasper large coin pendant, surrounded, again, by several strands of various gray stones and beads. But this time, her strands include various sizes and shapes of stones. I think t his highlights the way these would appear in nature. Not all stones would be round, or flat, or square, or, well, or anything. By mixing and matching shapes and sizes, this multi-strand commands attention, and announces its presence anytime it’s worn! I have one final piece I want to talk about and that is another wire piece. Jill has really outdone herself, combining a typical fiber craft, crochet, with wire and beads. She calls this her beadhive design and I love it! She’s used carnelian stones, metal leaf charms, and other chips and stones. However all of these have been added while she crocheted fine wire. The result is a broad choker, with nice cone finishing detail at the lobster clasp. Wow everyone with this beadhive design. 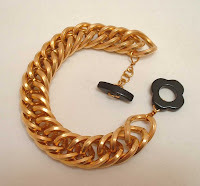 Jill’s online boutique “Jewelry Elegance” on etsy features many of her creations at http://jewelryelegance.etsy.com/. Jill gladly accepts custom orders so feel free to convo her for a prompt free quote. 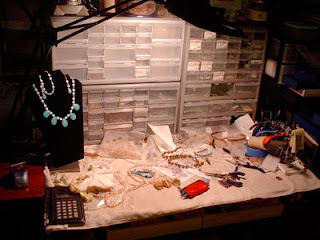 Visit Jill’s blog http://jewelryelegancebyjill.blogspot.com to learn more about this fascinating artist’s work and inspirations. Often this intimate peak into the studio environment allows us to connect with a designer and his or her work in a whole new way! Teri Baskett is a contributing editor and Team Blog Manager for eSMArts (etsy Social Marketing Artisans Guild) a global multi media collective of independent artisans. From her base in Jeffersonville, IN, Teri designs unique handmade jewelry collectables. Teri’s gemstone jewelry collections are available for purchase at http://www.sandtcreations.etsy.com. Twitter Tips , Should You Tweet? Do u tweet? Should u tweet? And, what the heck do I mean by "tweet," and why am I using the letter 'u' instead of the actual word you? Tweet is a new verb we may very soon see listed in the Webster Dictionary and refers to the act of posting on Twitter, a social network which is sort of a cross between myspace, instant messaging, and blogging. Members "follow" one another, and on their Twitter page they are asked "What are you doing?" They have a maximum of 140 characters available to answer this question (thus requiring tweeters to sometimes use "u" versus "you"). As you post on your Twitter page, you can also read posts from those you are following, so it is a fun way to get to know others as well as keep track of current friends and family members. It can also be very addicting because it is so quick, easy, and fun to boot. In addition to Tweeting on your computer, you can also take it mobile using your cell phone or black berry. Have a new item just added to your Etsy shop? Tweet about it and include the link, which Twitter will automatically change into a tiny URL so you don't waste too many character spaces on it. Just posted a blog entry? Wait, don't add it over there just yet. Instead, create a Twitter feed so that every time you have a new blog entry published, it automatically gets fed into your Twitter page. Once you have your Twitter feed set up, pop over to your Facebook account and add Twitter as one of your feeds there as well. Finally, search for others on Twitter who have similar interests. 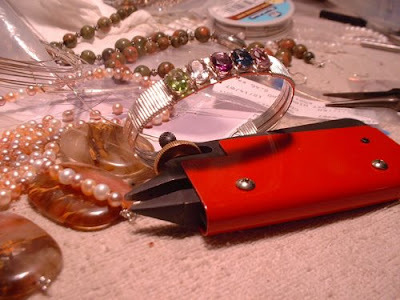 For example, I write about jewelry making as well as make jewelry, so I searched using the keyword "jewelry" and found some great people to follow who eventually started following me. Any time you have news, especially related to your business, tweet about it to help get the word out in just a matter of minute! I've been making jewelry now for a couple of years, but only in the past 5 or 6 months have gotten much more involved in it. As I explored different medium such as beads, wire wrap, metal clay, metal smithing I began to feel very excited. I've done crafts all my life, but I really felt like working with metal would allow me the creativity I've been looking for. I've never thought of myself as especially creative. I can follow any pattern out there but other than changing colors, fabrics etc, I'm not really good at making up my own patterns. I can't even draw! Now that I have started working with wire and metal I find myself working out designs in my head all the time. For example, my daughter sent me some black and white beads and asked me to make her a necklace from them. First of all, they are HUGE beads. They are 25mm round beads with black and white swirly pattern on them with 18mm solid black round beads. But I've been thinking about them in the back of my mind for the past couple of days and all of a sudden a picture of these big silver hammered square spiral links popped into my head. Now, obviously I can't take credit for "inventing" the link, I must have seen something similar in the past. But the magic for me is that the vision of the necklace developed in my mind. How cool is that? Never before, with knitting, sewing, quilting, cross stitch, anything at all, did that happen. This medium seems to have released something in me. I see ideas for new ways to combine things all the time. I've been using beads in the past few weeks that I have had for months and could not come up with anything. I guess the moral of my story, as such, is that everyone needs to find what excites them. It may not even be a craft project. It could be anything, in and field. Just find what brings you joy. We all need joy in our lives. I haven't given up all my other crafts, but they are what they have always been, hobbies that I love to do. In designing and creating jewelry I have found my passion and I hope my future. Thanks to the eSMArts Team for giving me voice. I'm sorry I missed my "official" day yesterday but I guess it wasn't meant to be yesterday, it needed to be today. Check out my other musings on Michele Cook Designs Blog and let me know what you think. Crafty Princess Joins Forces with eSmart! Before I start blogging away here as one of the newest members of the eSmart Team Blog, I thought I better step up and introduce myself. 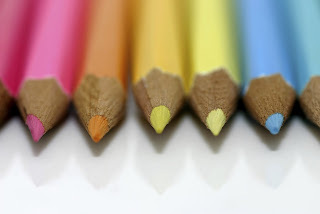 My name is Tammy Powley, and I am a writer, teacher, and designer. You may know me from my weblog, Crafty Princess Diaries, or from my About.com Jewelry Making site, where I've been writing and designing jewelry for about ten years. After opening the Crafty Princess Etsy Shop, where I sell jewelry making supplies, fine silver metal charms, and the occasional finished piece of jewelry, I discovered the eSmart Team and decided to take the plunge and join up in order to help promote my shop as well as get the "true" Etsy experience. The nutshell version of my life story is that I have a day job where I teach college English, and when I'm not grading papers, I'm crafting and writing about it. Though much of my writing and designing work has been on the Internet, I also have a number of jewelry making books published. You can read more about me as well as listen to an audio introduction at my weblog, the Crafty Princess Diaries, which I update just about daily. Looking around while sitting at my computer tonight in the midst of my beading projects and supplies and answering email, I realized it was probably time to clean up my work area. My goodness, if Mom saw this mess she would most certainly remind me of my teenage bedroom. So, I role on over to the working part of my desk and look around. Watermellon tourmaline in the process of be made into focal pieces, Akoya pearls looking for ideas and sitting with some beautiful real sapphire and ruby beads. Somehow, they need to go together. 100 inch fresh water pearl strands everywhere. Copper wire, silver wire, a mess of tools, several unfinished and finished projects, a cat hair roller??? Not really sure why that is there. Oh yea, gotta get rid of the cat hair on the black velvet stand. Hmmm. Cleaning, what cleaning....leave me alone, I'm creating.! 9x7 mm Peridot, White Topaz, Amethyst, London Blue Topaz and a Pink Spinel in Sterling Silver bracelet. Adjusts up to an 8" wrist. Look for this and other chaotic creations in my etsy shop A Beaded Affair and while you are there check out all my favorite shops and visit all the creative, talented and maybe not quite as chaotic ladies and gentlemen of the eSmarts Team. Last night the rain poured, lighting struck a zillion times. The news channel said to stay home if you didn't have to go out. Homes were burned to the ground after being hit by a lighting bolt. The trees in my backyard were doing their poetic dance with the wind; practically bowing down to the storm. It was beautiful in that frightening kind of way. I could feel the hairs standing up on the back of my neck. The doorbell rang, the dogs barked and I about jumped out of my skin. It was my new friend Elise. We were to go to our first meeting of our newly formed beading circle. We stood in the my kitchen and I received 2 phone calls from my family saying it was really bad out in the storm. Elise and I looked at each other and said, "you ready to go?". And we were off! There's not much that can stop you from doing what you love! We arrived at our destination 20 minutes late. Neither of us had met our hostess before. We were greeted like we were old friends meeting up again. Within 10 minutes there were 5 of us. Chatting like teenagers and showing off our treasures. Beautiful free form Peyote bracelets. Incredible Sprial necklaces still in progress. Precious Metal pendants, goregous strung necklaces; I was in my own heaven! I can never remember that saying, something about hell or high water, but you know what I mean. There was nothing that could have kept me from missing out on this bead circle. As we calmed down a bit and decided what we were each going to work on; the chatting continued. We learned a little about each other and set up a meeting for the next 2 months and whose home and what they would teach. Like little children, not wanting it to end, we each slowly headed towards our cars. With long goodbyes and see you soons, we were on our way. Elise and I were so deep in conversation about how well our first meeting went that she drove right though the light, with someone watching over us, all was safe! I don't know about everyone else but for a few hours last night I felt young again, excited about new friends and basically giddy over being surrounded by some very talented artists. I would highly recommend forming a beading circle in your town. Sharing time with friends is one of the greatest gifts I know. 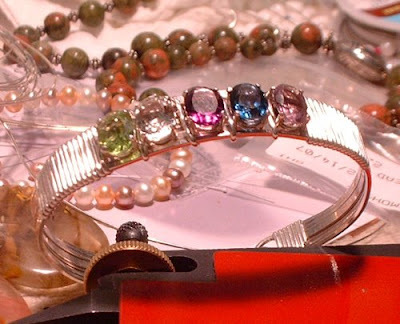 Sometimes we are faced with challenges in our jewelry businesses, from taking custom orders or in determining what to do with beads purchased by mistake. I normally keep a ruler in my desk drawer so I have a visual of the millimeter size before placing a bead order. But sometimes I am in a rush and don’t check. Or maybe you’ve seen a great strand of beads on an auction getting ready to end at ebay. You quickly buy the item only to discover they are 25 mm. You think to yourself “It just didn’t look that big on the screen” and then “what in the world am I going to do with these? ?” You then have yourself a design challenge! Another example - a beading friend of mine was asked to create a bracelet with large gold focal beads. The customer also wanted red and blue bicone crystals with it. The color combination was not something we would normally put together and the results were pretty much what we expected. We looked at each other and agreed that we did not like it. However, the personality of the customer came to mind and we knew better than to question her wishes. Although the color combination was not pleasing to us, the buyer loved it. And that’s the important thing; that the buyer is pleased. I love taking on custom orders, but they are also intimidating at times. Sometimes we need to learn a new trick to accommodate the request. When someone asked for a necklace with a beaded drop for the first time, I needed to figure out how to do that. Custom orders help us grow as artists by making us do new things, or see things in a new light. What we’ve learned too, is that there is pretty much a buyer for everything! We’ve made things we don’t like and think “this piece will never sell” only to see them move quickly. Much to our surprise! So if my friend makes something that she doesn’t like, I remind her there is a buyer for everything. I may not like huge chunky 25 mm beads on my petite frame, but others may love them, are taller than me, and can pull off the look. It’s important to think beyond what WE like. Have you considered your own jewelry style as it evolves over the years? Most of us can look back at particular pieces or photos of past work and realize how far we’ve come. We want to move our older inventory because our style and techniques have changed. Or we tear apart old designs to reuse the beads in a new creation. So remember, it is pretty easy to make something that we like. The challenge is to create something outside our comfort zone that is pleasing to someone else. This helps us to grow and learn from the experience! If anyone on our team has any design challenge stories, please share them with us. We would love to hear about your experience. And we can learn from it too! My name is Kim Ries with Creative Eye Studio and I am from Louisville, KY. I have been creating jewelry for the past two years, but have enjoyed being creative all my life. I took drawing and painting classes in high school and college, but had a long span of non-productivity. In the late 90’s I rediscovered my interest in art with photography, rubber stamps, collage and altered art. I always purchased beads when something pretty caught my eye and I would hoard them for future art projects like tags or handmade books. Even when I was not creating jewelry I was buying beads. After taking a basic jewelry making class with a friend, I was hooked. 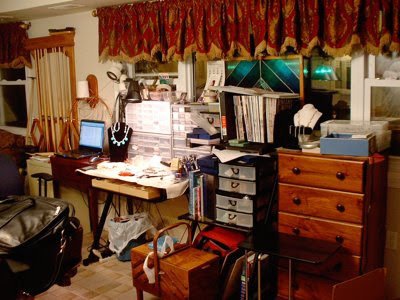 This led to a 6 week metalsmithing class, a silversmithing class and a lampwork bead class. After taking the lampwork bead class, I must admit I have a new appreciation for this art form. It takes a great degree of patience and skill! I am anxious to work with metal clay, but need to convince my husband exactly why I “need” a kiln. With these classes, I have learned new techniques and styles to integrate into my designs. In April of this year, I received a BS degree in Marketing. I plan to use this degree not only in my regular day job, but also to help promote my jewelry business. Inspiration for my designs is found in different color combinations, items found in nature, earthy elements, etc. I would describe my design style as elegant, feminine and classic. I like to use sterling silver and copper, natural gemstones, furnace glass, fresh water pearls and Swarovski crystal in my designs. I love photography and am learning to use a new Nikon digital SLR camera. I can't tell you how many perfect photos I've captured with my eyes but did not have the camera with me. It's hard to turn off that moment when you see a perfect picture in architecture or nature. And it’s a lot of fun to combine my love for photography with the jewelry. Two art forms in one! I just started a Photoshop class this week and am hoping to learn more about editing my pictures. It seems I will always be taking a class in something, and the retreats that Auggie described this week in our team blog sound very intriguing. I feel ongoing learning is a part of the process where we grow and get better at our craft, and have some fun along the way. I am so grateful to the eSMArtsteam for the encouragement and knowledge about online marketing. My head is swimming most days with all the new things I have learned about blogs, etsy, technorati, squidoo, etc. And to think last month I had never heard of technorati and squidoo. When I lay down at night, my head is filled with all the new things I’ve learned in just the past month or so. I know that I need encouragement to motivate me to move forward and am so happy to be a part of the team. In the individual member blogs, you will notice that the talent level of the team is quite high. This too, gives the rest of us motivation and inspiration in our future designs…to be the best we can be! In tomorrow’s blog, we'll discuss design challenges for artists and how to get beyond our comfort zone. Stay tuned! Hi! My name is Kari Bryde and I am a member of eSMArts and the owner of Novel Approach. My formal education is in Interior Design. I feel like jewelry pieces are mini architectural structures. I decided to make a change from designing environments that enhanced my clients’ lives to designing adornments that enhanced my clients’ personal images. Many of my designs have a commitment to “Repurposing.” “Repurposing” follows the school of thought of Sustainable Design; i.e. finding what you have in your environment that is usable and choosing to redesign a piece in order to give it new purpose and a revived enjoyment. My style employs crafting contemporary jewelry built around vintage components. I love the idea of time creating an energy continuum. I think about what a woman must have felt and thought when wearing a piece of jewelry and I like the idea of passing that energy along. Every time a woman wears a piece of jewelry she adds a layer of experience; I like creating pieces that can bridge past experiences with new ones. Yesterday I talked about our economy, how it is affecting us, and some things we can do about it. Today I want to talk about an alternative to the expensive bead classes at the large bead festivals. Don’t get me wrong; if I had the extra money, I would be there! I love seeing all the beads, the designers, and participating in the classes. They are amazing! But in today’s challenging environment, for some of us who still want to be active and enjoy the company of other beaders, there are some great alternatives out there. First let me tell you about the Bead Retreat group I belong to. We had our first get together this past June right outside of Gatlinburg, TN. We rented a “Quilters Lodge” with the most beautiful view of the Smoky Mountains. There were 9 ladies and most of us had never met before. You would never know it by the way we all felt immediately connected. Even though most of us live in the Mid Southern States, some traveled from as far away as Florida and Indiana! and we even had Jim McIntosh come and teach us Wire Wrapping. He and his lovely wife dined with us on my homemade pork burritos and Texas Margaritas! We didn’t have to leave the house; we didn’t want to leave the house! You got up when you wanted to and went to bed when you were tired. It felt like home and everyone became an instant family. We learned so much that long weekend. It was such a pleasure to meet the folks you are in groups with and leave with new friends. We areplanning another for late October just outside of Nashville. Another new thing I am getting involved in is a Beading Circle. It’s just like a Quilting Circle but with BEADS!!!!!!! Some members from some groups I belong to tracked me down and we only live like 10-15 minutes from each other. We have even been going to the same Atlanta Bead Society meetings every month and had never met. It is a small world but if you don’t speak up you will never know what you are missing. The next Circle hasn’t been scheduled yet but I will be there for sure. And I mentioned, we have a Bead Society here as many cities do. The Dues are not much; I only pay $25 for a year and that includes taking a friend or family member with me. We always learn something new and there is much to look at and buy. Some of us go for pizza afterwards to know each other better. We have 40-50 members present and when you’re learning a new beading technique you don’t take time to chat. Hopefully I have given you something to think about and you can come up with some ideas of your own to socialize with fellow beaders without using too much gasoline or spending a lot of money and still have a great time! Here are some pictures from our Bead Retreat. Check out your local area for If you live in TN, GA, AL, NC. SC or Lower KY & IN or are willing to travel, send me an email and I will invite you to our group. We’re all working on projects and having a great time! Don’t think we brought enough to eat though! How is the economy effecting us all? This is me, Auggie Parker. I am a proud member of the eSmarts street team. 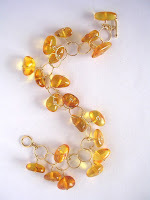 Visit my personal Blog for links to various jewerly tutorials. I also have my own Etsy store and have just recently started adding items. I hope you will stop by and take a look. I have been thinking all week about what I would write, and have gone back and forth on a few different subjects. My decision was our economy here in the U.S. and how it is effecting the sales of non-essential items. I realize this does not apply to everyone but even in our home we are really cutting back where we can. The cost of oil effects more than just the gas tank, which is outrageous! Almost every industry is being effected and the cost is being passed on to all of us in numerous ways. I make candles as well as jewelry and the wax I use comes from petroleum. The cost is so high right now that if it does not come down by fall I won’t be making candles this year. Hopefully Oil prices will start coming down and all will be well again. But, right now how does this effect us; the artists, crafters and suppliers and more importantly, how does it effect our customers? Personally I have cut back on supplies unless it is a deal too great to pass up. I am looking at all of my inventory and seeing everything in a new light. I am searching my creative mind to think outside the box. I hope the result will be some exciting, innovative ideas. Also, instead of only designing higher end items which for my area is $100+, I am designing in several price ranges. Hopefully this will still attract my clients and grab the attention of some new ones. As a consumer, who loves to give gifts to friends and family “just because”, I am staying close to home and hand making more gifts than I usually do. I would like to think my receivers will appreciate the time and thought put into these gifts. I also think that many of you may be thinking the same way and will be looking for supplies to make these special gifts. If you take a look at my team members sites you will find exactly what you are looking for and at the price range you have in mind. We have so many talented and diverse members that there is sure to be a treasure with your name on it! Hi, I’m Teresa from Inspired Designs by Teresa. Please come visit my Etsy store or my blog. I started making jewelry about two years ago and had just begun selling it last summer when I got my first teaching job. So my marketing efforts were put on hold for the school year. Just as I was beginning to think about getting back into the online marketing world, Anna Lee of GaHooleeTree proposed starting a new street team on Etsy to learn the ins and outs of social marketing on the internet. I jumped right on the bandwagon, and it has been quite a ride. Although it has been only a few months, we have 90 members in our Yahoo group and represent 49 Etsy stores! One of the challenges of growing so quickly is keeping up with all the members. Most of our members are from North America, so I thought I would use my blogging time to highlight our members from across the pond, or, in one case, across the world. Jackie and Lara are a mother and daughter team from Devon, England. In their shop they offer elegant handcrafted jewelry. 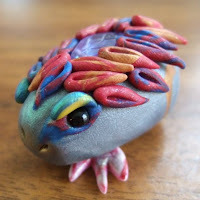 Lara (the daughter) also has another store where she offers adorable creatures made from polymer clay or felt. She also offers a banner and avatar design service, so contact her if you can use her services. Morna is a self-taught jewelry designer from Perth, Scotland. Visit her Etsy store, to see both her finished jewelry and surplus components. She has some lovely copper components, and we all know that right now copper is hot, hot, hot! Wezz lives in Kessel-Lo, Belgium. Her store currently features handcrafted jewelry, but Wezz admits that all kinds of crafting is in her genes, so who knows what will pop up in the future! And, from the other side of the world, we have Annette from Coolah, Australia. From her rural oasis Annette handcrafts refined and classic pieces which she offers for your viewing, and if you’re lucky, wearing pleasure. Take a look at her beautiful store. Today I tried to improve my presence on the internet so I could support eSMArts members more and promote our team and my business. So I created accounts on various websites and have been trying to figure out how to link my photos on my website to my sales pages on etsy, and cross-linking blogs, favorites, friends, etc. Still want to learn how to do video, like youtube or squidoo--I'm not ready to create a tutorial yet, but that would be a great start. Since few of you really know me, I gotta confess--I have always absolutely hated having my picture taken, and never liked taking photos either. So, here I am talking about going way beyond a still photo to active video clips!!!!! Wild, to me anyway. It has been great to read posts from other team members to see how we type/write/webspeak differently; sometimes I think my writing sounds stilted and not as "fun" to read as others, so guess I can work on that too---let's see, learning web processes, changing how I write on blogs, improving my pictures, creating and uploading video, oh----actually, possibly, making some of those projects in my head----yep, self-improvement time is here! Big things happening this week for the eSmarts Team members participating in a social marketing team on Etsy. Three of our members Tortoise Treasures, Inspired Designs by Teresa and Willow's Beads have had sales, for some their very first and our very own Vamp Kitty has posted for the first time. Starting us off was Tortoise Treasures with this charming German Silver wire wrap of a turquoise blue agate with a crystal in the center of the stone. Nice work Shelley. Check out more of Tortoise Treasures creations and watch for more turtles to come. Next off was Inspired Designs with these two lovely pieces "Copper Swag Choker", truly a beauty with rich copper and garnet beads and "Red Porcelain and Copper Drop Necklace". Those beads are one of a kind. Way to go....two sales in one day, you may be the Seller of the week but the week isn't over yet.....keep marketing. Don't miss seeing more of Teresa's Inspired Designs. Vamp Kitty impressed us all with her first postings on Etsy. So glad you did. Your pieces are wonderful. I'll be watching your shop for many more postings to come. My favorite is "Mermaid" in Seafoam Amazonite, Chrysocolla and antique copper bali beads. Check out Vamp Kitty for all her new postings. These team members are proof eSmarts works. Check out eSmarts for a team that makes things happen.............fast!